There's a veritable gold rush going on beneath the world's oceans as nations and multinational corporations alike vie to discover and exploit a wealth of minerals and energy trapped within. Off the coast of Western Australia, for example, General Electric has tapped into a massive reserve of oil and natural gas, pumping the valuable resources to the surface with help from a forest of highly-specialized "Christmas Trees". 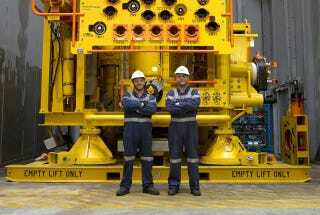 These enormous subsea devices—each topping 81 tons—clearly are not like any Christmas tree in the conventional sense. They act as valves to control and monitor the flow of petroleum and natural gas from wells dotted along the seafloor—specifically from the Ichthys LNG Project in the Browse Basin, 124 miles off the coast. They earned their nicknames from the bevy of exterior lights, dials, fittings, and control hardware—like a Steam Punk Christmas tree. Designed to operate hundreds of feet below the surface, where the surrounding water pressure is great enough to crush metal, each device first undergoes rigorous testing at GE's Jandakot technology facility. "We test them up to operational pressures of 15,000 PSI," GE workshop technician Martin Birse explained in a press release. "That's 500 times greater than a car tyre, or 1,020 times greater than the pressure of air at sea level." And given that the interiors of these devices have a tolerance of 2 millionths of a meter, their exteriors can have any give.